What is Craig Dykers doing in the corner? 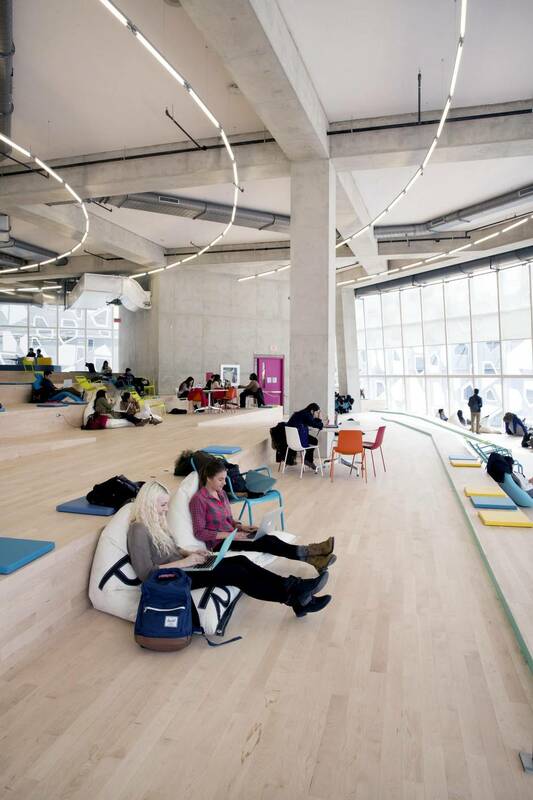 It’s a week before the opening of the new Ryerson Student Learning Centre in Toronto, and Dykers, its lead architect, is touring its most dramatic space: Nicknamed “the Beach,” it’s a cavernous, two-storey room whose floor slopes down through a zigzag of wooden terraces. It’s studded with angled columns and its glass façades are printed with a pattern of twisted polygons. Natural? This is the crowded, grimy centre of downtown Toronto, and the 155,000-square-foot building doesn’t resemble anything in nature, except perhaps a giant block of ice that’s melting at the bottom. This is Snohetta’s work: Design that makes you think. Led by Dykers in New York and Kjetil Thorsen in Oslo, the firm works in architecture, landscape architecture, graphic design and branding. And in the past few years, they’ve quietly become one of the world’s leading design firms. 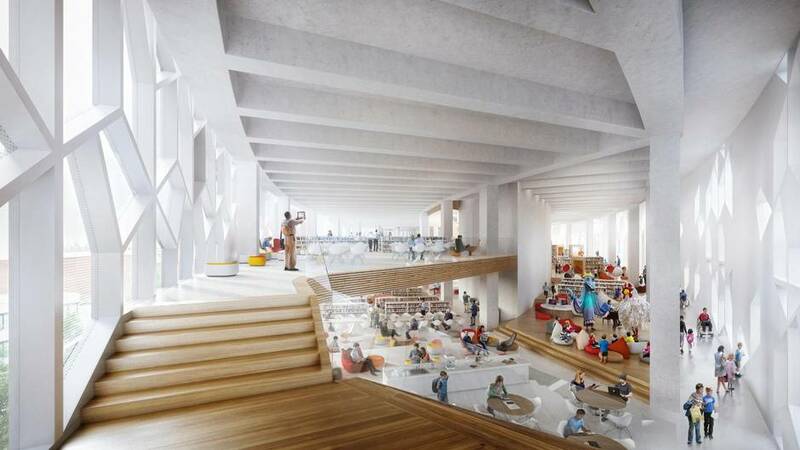 They have more than 60 ambitious projects under way, including Calgary’s New Central Library and an expansion of San Francisco’s Museum of Modern Art. Each of their projects, though, reveals a truth about design in 2015: To make a building or a landscape is a hugely complex and collaborative business. Many famous architects obscure that fact, and present themselves like fashion designers, delivering a tight brand and a singular sensibility. Snohetta carry themselves like a collective of filmmakers: Their work has no set style and no manifesto. It is visually bold, but shaped by observation and empathy. Snohetta’s rise comes at a time when the design world is caught between grandiosity and modesty. The downturn of 2008-09 marked the end of the Starchitect Era: an anomalous decade-long period in which architects assumed a new authority as sculptors of form that could transform cities, as Frank Gehry’s Guggenheim did Bilbao in 1997. Today, a few celebrities, such as Gehry and Zaha Hadid, continue to carry such cachet. But many younger architects profess an interest in socially responsible design, sustainability, and a more pragmatic and ego-less style of working. It is almost dark, but the signs and screens in Times Square are shining brighter than ever – and at my feet, the pavement is shimmering, too. Small steel discs in the paving stones catch the light, signalling to me where to walk. “We want people to be affected by this, even if they aren’t aware of it,” Claire Fellman, a landscape architect and director at Snohetta, explains, half-shouting over the din of the crowd. In this respect, Dykers cites the influence of Temple Grandin, the famous observer and theorist of animal behaviour. “Where she says ‘cow,’ you can substitute ‘human,’” Dykers tells me, “and it makes perfect sense.” What’s most valuable, he adds, is Grandin’s scientist’s mindset: observing her subjects, not making rules for them. This is the sort of empirical, empathetic approach that drives all good design. Over the past decade, Snohetta has shown a remarkable aptitude for it – and for the seemingly opposite skill of designing memorable grand gestures. “I don’t like the word ‘icon,’ but sometimes it sneaks out,” Dykers says with a smile. With commissions such as the $365-million (U.S.) SFMOMA project and a new headquarters for Le Monde in Paris, Snohetta is approaching the top tier of global designers in architecture and making a real mark in landscape architecture, too. This summer, the firm announced new commissions for an important market hall in Portland, Ore., and a gondola in the Italian Alps. Snohetta runs in a genuinely collaborative manner: While a design is in development at the New York office, everyone sits together at one long table to hash out ideas. “You don’t always get what you want,” Dykers says. “Half the time, I lose the argument.” Dykers and Thorsen are also happy with a degree of anonymity. The firm took its name from a Norwegian mountain, choosing not put their names on the door; they have never changed that policy. That’s easy enough to believe. Dykers, 53, has the strong laugh lines and balding pate of a frequent-flying Buddha. Born in Germany to an American father and a British mother, he has lived most of his life in Europe. Like many successful expatriates, he is soft-spoken and an attentive reader of people and places. These qualities were useful in small, egalitarian Norway, where the firm grew through the 1990s. Their breakout, in 2001, was the Norwegian National Opera and Ballet in Oslo. On the inside, it is a no-nonsense cultural complex; on the outside, a cluster of pale wedges that let you walk onto the roof of the hall and right down into Oslo Fjord. It is part landscape, part building, highly functional and very sculptural. All thoughtful architects claim this about their work. Snohetta delivers. 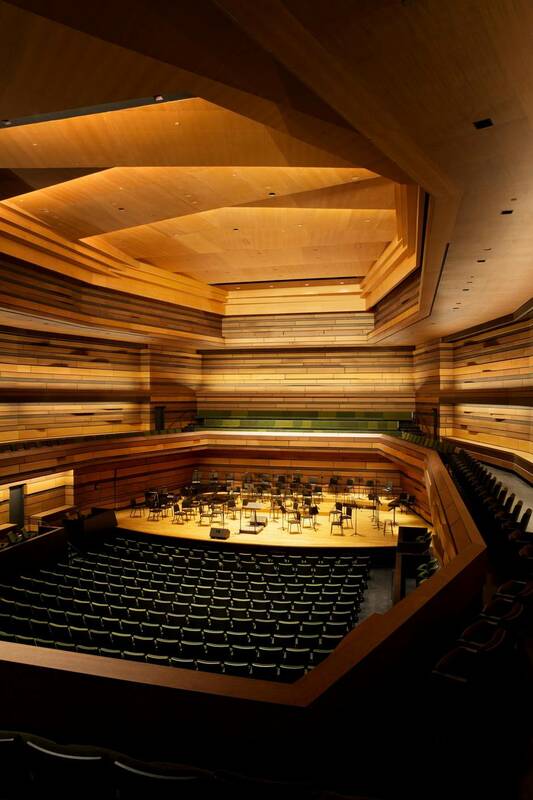 The Oslo opera house received uniformly strong reviews for its acoustics; so has the firm’s first project in Canada, the Isabel Bader Centre for the Performing Arts at Queen’s University in Kingston, which opened last fall. Overseen by Snohetta’s Takeshi Tornier with N45 Architects of Ottawa, it is a loose agglomeration of prisms and slabs that fits the stony campus while making a contemporary statement. 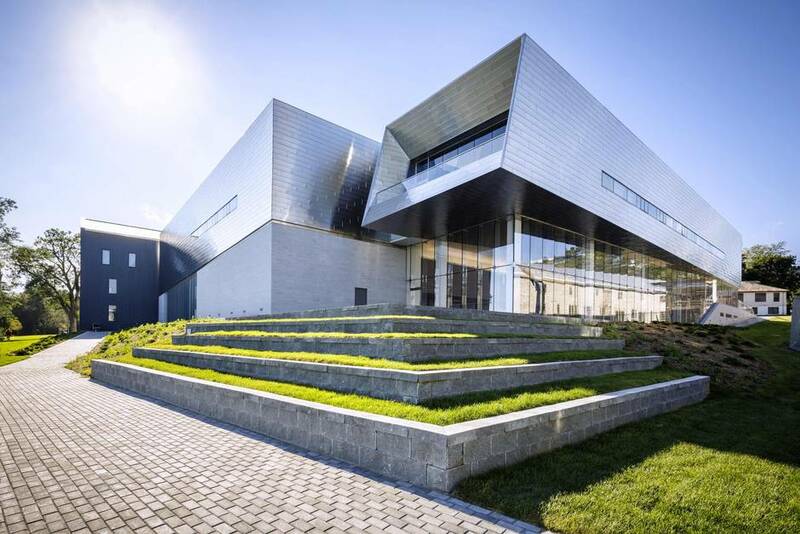 The same pattern repeats in the stainless-steel shingles that wrap the exterior of the building. Yet they are a lower-grade steel that refracts light, a quality known as “oil panning.” This irregular quality was what the architects wanted. “When the sun is out and it hits the lake, the quality of the light is never uniform,” Dykers says. On a grey day in late spring, I saw one steely arm of the building reach out to the lake. Its skin picked up the light from Lake Ontario and shimmered in sympathy. From the right angle, the building looks like an icon; it takes its context and, literally, reflects it back. In 2004, Snohetta’s diplomatic manner helped win a commission in the most sensitive site in the world: New York’s World Trade Center. It was for a gallery and museum building to sit on Ground Zero; a performing arts centre next door was to be designed by Gehry. The churn of politics and money around the site killed Gehry’s project, and Snohetta’s evolved into a pavilion for the underground National September 11 Memorial and Museum. It is a modest building on the surface, containing a grand auditorium and other functions underground – an architectural iceberg. The building is a Pyrrhic victory, but it gave Snohetta, then unknown in North America, a reason to set up shop in New York and push toward global prominence. In April, they were moving into new, larger offices a few blocks from Ground Zero, and Dykers invited me to their temporary space to discuss their recent work. The models and drawings suggested their reach across North America: drawings for a library in North Carolina, a small addition for the legendary restaurant the French Laundry in California, and a secret (for now) commercial project they’re working on with a big-name firm. Developing a new building in a new place means searching for new sources of narratives. 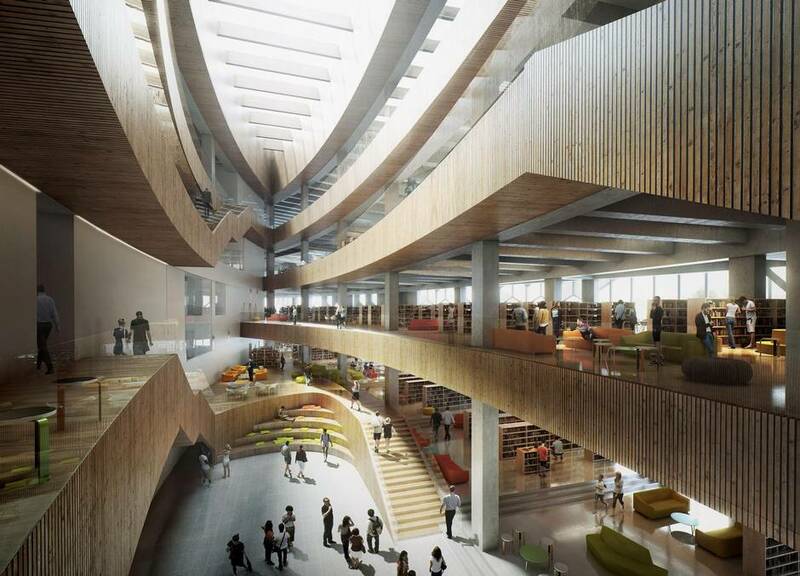 For Calgary’s New Central Library, which Snohetta is designing with the Calgary office of Dialog, the architects drew on the Chinook Arch – those powerful, unusual cloud formations that appear so vividly in the area. Instead, the library looks more like a giant, elegant jellybean, with a skin of glass and zinc in a motif of triangles and diamonds. Within are a large atrium and an interior that unfolds, hospitably, as a series of terraces. This will be easy for new visitors to read; “You can build a mental map of where you are right away,” as Dykers puts it. Outside, the terraces continue as outdoor public plazas – ready to lure people on foot into and right through the building, on a path between the redeveloping East Village and downtown Calgary. The design elegantly solves the many problems of the site, which is sloped, has an awkward geometry and is sliced in two by the LRT. The library could have been a slab and an obstacle. Instead it’s something more supple and complex: architecture and landscape together, shaped to make the city better. Will it succeed it bringing people together? A week after the Ryerson building in Toronto opens, I return to see how it’s working. Upstairs, the beach has come to life: Hundreds of students sprawl on colourful cushions and chaises, reading textbooks or watching videos. And four young women are studying together in the room’s quietest corner. It’s as if the place were made for them.